Is anyone else as surprised as me that this experiment with knives didn't end with a trip to the ER ? It was kabob night. I have a bone to pick with whoever it was that said, "If your kids are involved in the prep work, they will eat whatever you put in front of them." That person is pure crap with kids who probably also poop glitter. Because I don't care how many veggies they chopped or how cool it was to spear squash with a skewer,﻿ my kids were still not touching grilled zucchini with a ten foot pole. But meat on a stick? Well, that's a different story. Meat on a stick = good. And whatever it is about grilling that suddenly makes a man capable of cooking dinner also equals good. That lean, mean, grilling machine also turned the big 3-4 a couple of weeks ago.﻿ It was a real throw down event as evidenced by the fact that people began taking their shirts off during the party. In other news, our beloved Kentucky Wildcats are in the final four. They are playing their arch rivals (Louisville) for a shot to be in the championship game. Essentially what this means is that in Kentucky right now, people rooting for opposing teams are beating each other up while they are hooked to dialysis and the state government has pretty much shut down. Do you want to know what I think about it? Yep- that's me, fast asleep during the second half of the last UK game. I found this picture on my phone. I think the mister took it and could be planning to use at as some form of blackmail. I'm beating him at his own game because I'm sneaky like that. Mwuhaha. 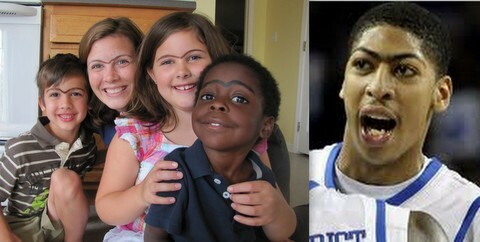 Prior to falling asleep, I was all about the game and paying homage to our star player, Anthony Davis- who has become famous for his giant unibrow. But, when these people don't schedule games until 9:30 at night, I just can't stay awake, even if I am startled back to life every few minutes by someone screaming at the television. I'll give five dollars to the person that can tell me in a way that makes sense, why certain people think that yelling at a magic talking box will make a team play better. I'm considering it one the universe's great mysteries. Like Stonehenge. One thing that is not a mystery? The adorableness of this "present" that appeared on my doorstep. However, they may be justified in confusing his doll like status because with these glasses on I think he c﻿ould totally pass for a Cabbage Patch Kid. Man, wouldn't adoption be so much easier if we could just tell our kids that they sprouted from a cabbage patch? Or even explaining child birth? That's it. I've just made the executive decision. I'm erasing all prior history and until I decide otherwise, it is now official that ALL of my children (including the ones I gave birth to) came from the cabbage patch. (because ewwww... who wants to think about being conceived? Not me!) And on that note, I've also decided that I must now go and teach my children how to dance the cabbage patch because it's a critical life skill- like math or brushing your teeth or removing rodents from your hair.